Freedom is an expression that you’ll hear a lot this week as we celebrate America’s independence. Our forefathers had a vision for a country that provided citizens with certain rights and responsibilities for themselves and their neighbors. 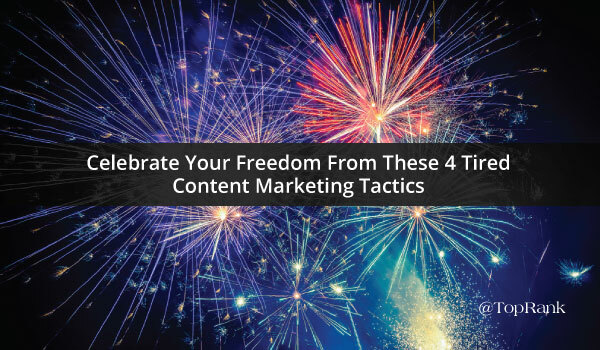 Marketers today have a unique opportunity to sign their own declaration of independence to free themselves of tired content marketing tactics. This is a declaration that removes antiquated approaches to content marketing and instead focuses on creating value for their customers in a way that builds a better future. Recent research has found that over 80% of marketers are creating content,which means that the competition for customer attention is becoming increasingly difficult. Now is the time for marketers to break free of tired content tactics and begin creating more memorable interactions with customers. As you continue to execute and refine your approach to content marketing, make sure that you avoid making the following mistakes. In the past, many brands spent time creating content for their website that only provided detailed information about their products and services. Today, the companies that are creating content that speaks to the pain points of their customers are the ones that are winning at content marketing. Today’s savvy and connected customers have countless options available to them which means that marketers must spend their efforts providing helpful resources that focus on solving the top pain points that customers are facing. Imagine for a second that you wanted to buy a specific type of firework to celebrate the 4th of July with your family and friends. In order to find the best location for purchasing your fireworks, you did some research online. However, once you got to the actual fireworks stand, nothing matched what you found online. Instead of finding the fountains and rockets that your family had their heart set on, there were only snakes and poppers. When brands fail to provide accurate information and a consistent user experience across multiple channels, it creates an unpleasant experience for their potential customers. We now understand that often times it takes multiple touch points to convert a customer which means that no matter where they are interacting with your brand online, they should be provided with accurate information in a consistent way. Once you get into a habit (any habit) it can be incredibly difficult to break. It can be easy for brands to get in a rut with their content marketing tactics because let’s face it, once you understand how to plan for, execute and measure a particular tactic, it becomes more comfortable each time. It doesn’t matter if you’re selling B2C or B2B products or services, at the other end of every purchase is a person that is driven to make a buying decision. While a company’s content could very well be optimized for search engines in a way that makes them findable, that doesn’t mean that it’s optimized for their buyers. Once a potential customer reaches your website, offsite content or social profile, you have a very limited amount of time to create an impression. If they can’t see themselves in the content, then they will quickly abandon your content in favor of a content that better suits their needs. You have the freedom to constantly delight your customers and innovate the way that you approach content marketing. Don’t be content with the status quo.The bar for content quality is constantly being raised so it’s incredibly important that you take every step necessary to create compelling content that connects you with your customers. What other tired content marketing tactics would you like to see your brand (or other brands) break free from?